In many ways, dairy farms are the cornerstone of Maine’s farming community. Dairy farmers steward large tracts of farmland for feed and forage, while supporting the feed stores, equipment retailers, and large animal vets that all Maine farms rely upon. Of the 400,000 acres of farmland that will be in transition over the course of the next decade, we anticipate that a large percentage of that land is currently in dairy farming. What will happen to that land, and the infrastructure and communities it supports? Caitlin Frame and her young son Linus are in charge of the pig chores at their farm. Together they carry buckets of whey and bags of feed out to the pasture, and once there, it’s a matter of minutes until they are both covered with splashes of mud, milk, water, and grain dust. It’s a messy job, and a lesson in teamwork– an essential element in operating a small, diversified dairy farm. As with many farms, the success of The Milkhouse farm depends on a broad community — family, fellow farmers, service providers, customers and consumers. Caitlin and Andy farm cooperatively with their neighbors Gregg and Rhiannon of Grace Pond Farm. “We share land, advice, and other resources,” said Caitlin. The dairy farm also employs three other full-time employees and all share in the task of raising animals “with all the space and freedom to behave as cows, pigs and chickens will,” and producing delicious food. Farming is tough, and dairy farming is particularly challenging. 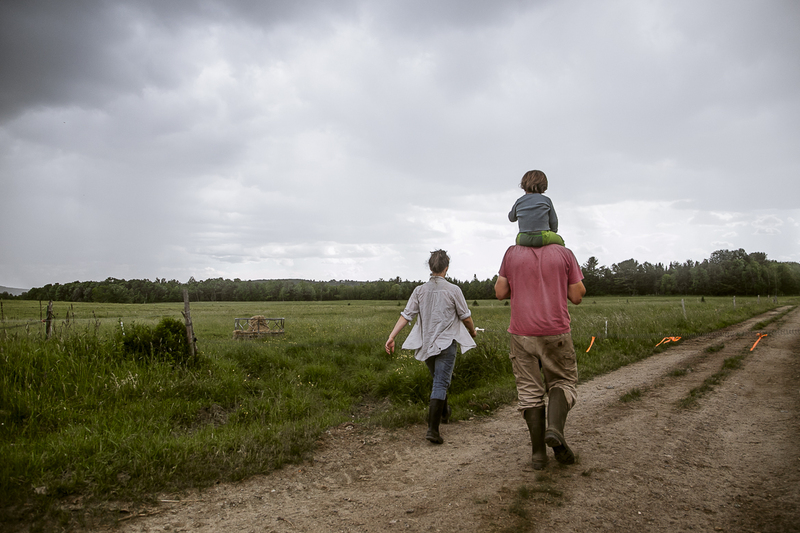 Young families like Caitlin and Andy, who are taking on the challenge wholeheartedly, and are building community in the process, spark hope for the future of the industry and in turn for Maine’s farm and food system. You can find The Milkhouse’s YOGURT AND MILK at these locations and at their farmstand in Monmouth.